Bring an upscale flair to your master bedroom with the Bergman Queen Bed. It showcases an elegant blend of classic and modern design elements with its arched headboard, finely textured fabric upholstery, and button-tufted accents. Amply supported by block feet, this transitional-style bed creates the perfect spot to relax and enjoy a comfortable sleep after a long day's work. Custom-order fabrics are available. Comment: Includes: Queen Headboard and Queen Footboard. Price may vary based on option(s) selected. 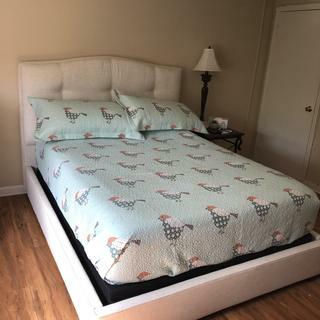 The picture of this bed online doesn't do it justice. The fabric and the quality of the construction is much better than it looks in the picture. I'm very pleased with the purchase. We have a Keetsa mattress in this bed frame and it is perfect. Well made and classy. The tufted headboard is so soft and comfy. My Serta Motion bed fits right inside.